Lab of the Future was the standard for the new research building of a pharmaceutical company in Switzerland. The aim is to improve the internal transfer of ideas through optimized communication and interdisciplinary cooperation of various disciplines in a building for 220 employees and a so-called compound bank - an arsenal of over 1.5 million active ingredients. 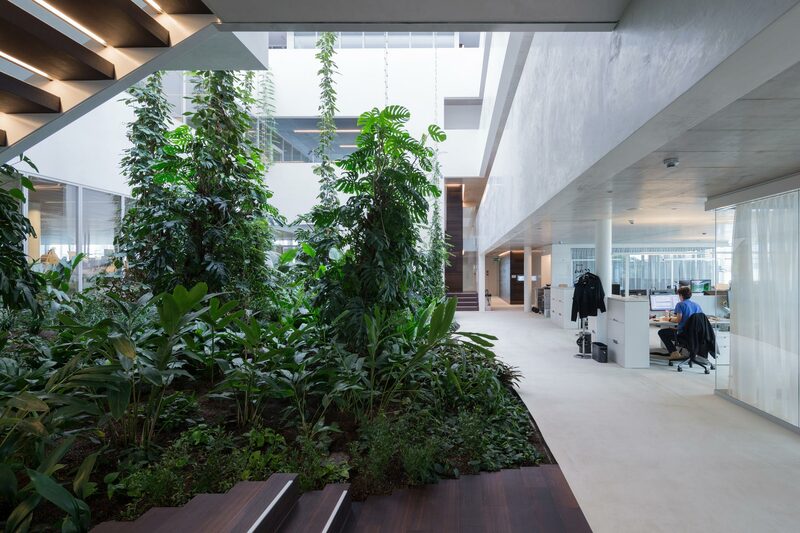 The symbiosis of open-plan laboratories and open-space offices makes two green atriums possible: one is located on top of the other. On the one hand, they create informal communication spaces with visual contact and, on the other hand, they combine the different room heights of the laboratory and office in a compact cube. The building has three different facade types: the south and north façades are dominated by glass and concrete; Glass and two multi-story loggias characterize the eastern facade; in the west, the façade has greenery on the outside; in connection with solar control glass there is no additional sun protection. On the other facades, motor-controlled sun protection blinds provide shade if required. Open-lying, thermoactive concrete floors temper the office space. Additional underfloor convectors on the façade allow for individual adaptation of the room conditioning; fresh air flows in as source air over a cavity floor. The laboratories, on the other hand, are conditioned with air alone with reduced air exchange. 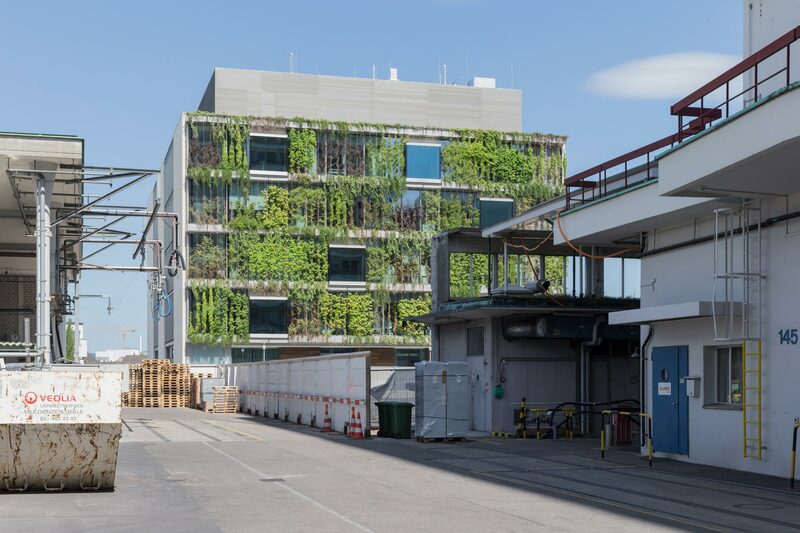 The daylight concept enables intensive greenery on the upper atrium, which is illuminated naturally and in a controlled manner by roof skylights. External, rotatable and reflective horizontal louvers direct light into the room via skylights. The plants receive sufficient radiation of all required wavelengths throughout the year. Geothermal energy in combination with brine-to-water heat pumps provides the energy supply. The supply air of the offices is conditioned by DEC (desiccative evaporative cooling) units to the desired temperature and humidity. DEC works with adiabatic cooling by evaporation, heat exchange, as well as the drying of the air by sorption. This saves energy and minimizes mechanical cooling capacity. High-temperature heat to drive the sorption comes from an adjacent waste incineration.